I love the Post Apocalypse. I love mutant bears with lasers coming out of their eyes. I love libidinous frog men trying to keep Rowdy Roddy Pipe down. I love spike covered muscle cars and psychic dogs and cross country treks in tricked out APCs and the rockabilly battles of Old Vegas. 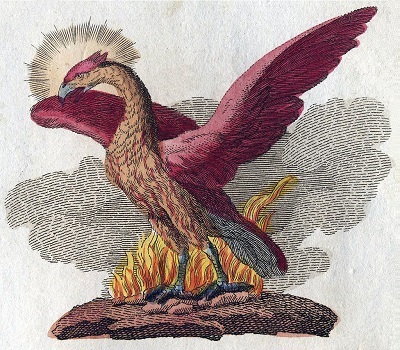 But as much as I love the post apocalypse, it is really all prelude, because what I really love is the post-post apocalypse: when civilization rises from the ashes like the titular mythical bird of this post. Stories about the end of civilization are fun. Characters are given permission to go native and lose their inhibitions, and in the context of games (both tabletop and electronic) you are too. It’s cathartic, blasting mutants and zombies and cyborgs and mutant-zombie-cyborgs. But it is also ultimately limited: the world is dying and man is fading and no amount of weird super-science or gritty survivalism can change that. But when the spark of renewed hope appears, when it looks like the world might just crawl out of the crater, that is when things get interesting. I would contend that much of the best post apocalyptic fiction is actually post-post apocalyptic, because it is not about the End, but the New Beginning. Let’s take for example a pinnacle of the genre: Fallout. Across many games and some tie-in media, the world of Fallout is celebrated as a perfect post apocalyptic story. Except it isn’t. From the very first Fallout game, it is a story about hope: can you find the water purifier chip and save your people. Along the way, it turns into a story about how new powers are trying to control the new world and usher it into a new age. That doesn’t sound like a whimper or a bang. Fallout 2 is more explicit in its metaphor, casting the player as an uncivilized tribal that enters and embraces the new civilization. By the most recent Fallout 4 you actually create, manage and preserve civilization in the form of settlements. When post apocalyptic stories center around creating a new world order, abolishing the monstrosities of the past, reclaiming lost knowledge or otherwise building something new, they transform into post-post apocalyptic ones. Now, sometimes it is a bit of a bait and switch: The Walking Dead, both on the small screen and on the page, is a post apocalyptic story. it flirts with hope but ultimately smashes it with a baseball bat or devours it with a horde of the cannibal dead. The original Mad Max qualifies as well: there is no real sense that things are going to get better by the end of that film; they gangs will just keep fighting one another until all the gas is gone. Interestingly, The Road Warrior transforms into a post post apocalyptic tale just at the very end when we hear the narration of the feral boy grown into an aged storyteller: there is hope and a world beyond Max’s diesel powered Hell. Both Beyond Thunderdome and Fury Road are, like the later Fallout games, more explicit in their embracing of the post-post apocalypse. Each of those films promises a future. Narratives more easily recognizable as post-post apocalyptic are often set much longer after The End. A Canticle for Leibowitz is a recognizable example of this, if a bit less fantastical and weird science than much else in the genre. The tabletop role-playing game Numenera from Monte Cook qualifies, too, along with the upcoming (and awesome looking) Horizon: Zero Dawn Playstation game. In each of these examples, enough time has passed that the world is on its way to healing (although usually things are still much more primitive than they were prior to the apocalypse). Here the events of the apocalypse and subsequent rebirth serve as a stage for whatever drama is to follow, rather than the plot itself. The slate has not only been wiped clean but new social, political, religious and cultural structures have been built and these worlds often have similar features to second world fantasies. My own upcoming novel Elger and the Moon fits into this category. There is an optimism in the post-post apocalyptic genre that makes me happy. I like to think that however badly we screw it up, humans are just smart, tenacious and lucky enough to avoid completely destroying ourselves. The struggle to survive is interesting but it is also exhausting, and with all the things in the real world that seem so hopeless sometimes, a dash of hope in my leisure-time adventures is much appreciated.